provide simple string-to-string conversion: initial guess in; unique username out. That way it can be used in many different places, not reliant on specific workflows, or modules being in place. assume the initial guess was itself a valid username, because different sites have different rules or conventions about that; so don't process the username except as required below. ensure safety at the database level by respecting the limits on username length there. ensure safety at the code level by not trying for uniqueness indefinitely, and using exceptions to notify other code of unexpected circumstances. permit parametrization of both the delimiter between the suffix, and the maximum value of the suffix before throwing an exception. * Helper function: create a unique username from an initial guess. // a delimiter and an N-digit number. // Loop to check uniqueness of trial username(s). // Set up the next username in advance. // Loop until either nothing found or we've maxed out our iterations. // If we've maxed out, throw an exception for rest of code to handle. // Otherwise, return the username. Each call to the function makes only one SQL query, because a repeated query in a PHP loop performs badly. Given the default maximum iterations is 99, if something goes wrong then that could be an issue. I don't put any limit on the SQL query, because the sort order of varchar is not and cannot be made numeric. That means that if I limited it to a certain number of records, I wouldn't be guaranteed to get them back in the same order as my PHP iteration. The function might then return a name that wasn't actually unique. It's not thread safe: it doesn't "reserve" the username at all in between the function call and when you create it. I've also reformatted this in the browser since testing it, so you use it at your own risk! The function does not take case-insensitive collations into account. E.g. if submitted name is "FOO", the query will (correctly) find user named "foo". But when checked using isset(), which IS case sensitive, the "foo" user is not seen, and the function happily returns FOO as unique. 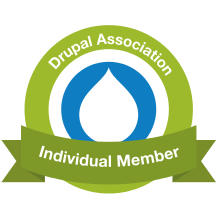 This can cause nasty, fatal errors when Drupal goes to save the record. Change the select statement to: "SELECT LOWER(name) as name ..."